If you're tired of the accessories and artwork in your home, why not transform them into a sculptural art installation? This simple project will refresh the look of any room. Flat planes and geometric shapes echo your room's architecture, while carefully selected found objects add visual interest. 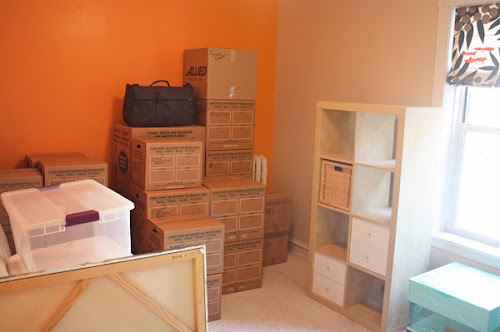 Place your belongings in boxes and seal each with tape. Stack the boxes in piles, varying the height of each column to create visual rhythm. Add a few focal points to draw the eye. Here, I've added a green suitcase to break up the field of beige. I pulled in a few additional elements— plastic tubs and artwork— to complete the composition. This is a simple, low-cost project any home owner can execute, and the result is a dramatic transformation. Fabulous! Heh. I have a similar installation coming up next year. There are already plans to showcase it in an additional location as well. These will be time limited displays, eventually dismantled in the second location. The dismantling will take years, changing from month to month until there is nothing of the sculpture left. This promises to be an amazing showcase and commentary on our ever changing consumer society. My all-time favorite post of yours. Melanie, what a coincidence! I, too, plan to recreate this installation next week in a new location. That's the beauty of these modular sculptures— they're easy to dismantle, transport, reinstall, and reimagine. Krista, great minds think alike. this always works well at the other "end" (in the new place). you can then designate it as a "traveling exhibit" with (hopefully) a limited engagement. keep your chin up! you're doing great!! Haha, too funny! Temporary art installation, I hope! Ha...my home office looks like that right now! Glad to hear I'm not the only one experimenting with "installation art!" ha, ha, ha, (now crying). This is what my entire house currently looks like! Excellent! Your home is truly a showpiece. You could charge admission. Love it! Good luck on your move. Love how you've used your orange wall as the "grounding" element for your new artwork! Love! LOL. I like the sculptural balanced element. Fabulous! I love the idea so mch, I have room after room of it. I am now slowly improving into my postmodernist phase and deconstructing my installation. Hopefully I can achieve a pleasingly minimalist aesthetic eventually. Love it! I have an art piece made from packaging material that a chair came wrapped in. It's kraft paper with holes in it, looks like a snake skin. My husband thought I was nuts to put it on the wall, but it makes me smile and people seem to love it when they see it. Funny! Way to go turning lemons into lemonade! If you're feeling especially creative, throw in some assorted shoe boxes and other unconventional containers. Colorful and a dash of shabby chic! Also, constructing your installation such that it obstructs doors and walkways is sure to act as a conversation starter on the nature of the obstructive nature of too much "stuff" in our lives. Those are some great tips, Annie. Thanks! I have done similar work, too. It's a work in progress, progressing toward minimalism as the box/tub elements are removed, and plans are to take that minimalist space and add elements such as wall art and furniture to gradually warm the space. We're calling it "home".Good luck on your move! haha this cracked me up! Good luck on the move! Hilarious:) We've been discussing a possible move, but the idea of packing makes us just change the subject quickly! This is great! I think I might try your DIY art installation on my girls' room! Fabulous...however I see no trace of your signature color...what's up with that? Perhaps a little colored packing tape is in order! (I hope I was not the only one that actually was scanning for how the "artwork" was going to be arranged!) Too funny! Unfortunately the Uhaul store did not have orange packing tape so I had to make do without. Tragic. Seriously funny, Jess! Hope your upcoming move goes well. We'll be thinking of you here in MN. I currently have a very similar installation on the go in my place. I like to pretend I'm building a box fort. I had to read the comments just to see if this was for real! lol. Seriously funny...when bloggers go batty lol. I currently have a similar piece installed in a warehouse. Other "artists" are displaying too, all of us in our own 5 x 5 and 10 x 15 enclosed galleries.